BACK ROW (L-R): Ambrose Welch, William Maltby, his wife Helen (Worden) Maltby, Bob Smolinski, Leon Maltby. MIDDLE ROW: Elizabeth (Kinsella) Maltby, unknown, unknown, Ruth (Maltby) Welch, Helen Smolinski, Gertrude (Maltby) Smolinski, holding son Phil on her lap. 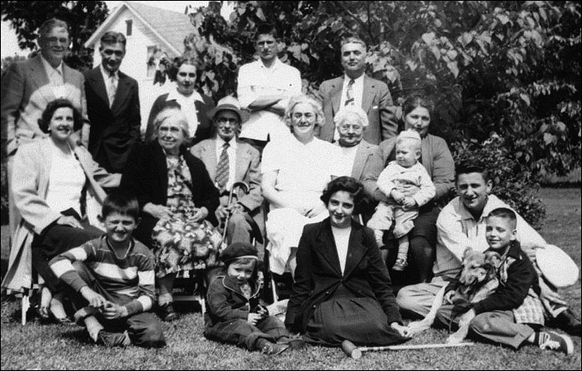 FRONT ROW: Jimmy Smolinski, Kathleen Maltby (Corgliano), daughter of William and Helen Maltby), Maureen Maltby (Finn), Bimby Smolinski, Jim Maltby, holding his dog, King. Thanks to Jim Maltby for providing the information for this family tree. Gertrude Maltby, a great-granddaughter of Minor Maltby, married William Smolinski, which is how our families were linked. Of all the people on our family tree, perhaps the Maltbys were the first to arrive in America. Minor Maltby of Baldwinsville, NY, married Avaline Vosburgh (1819-1891) of Camillus. About 1866 they moved to the town of Brutus, in Cayuga County, but a few years after his wife's death Minor Maltby moved again, to the village of Jordan. JORDAN, January 9 — The funeral of Minor Maltby, 97, was held at the home of his daughter, Mrs. Charles Nesbitt, at 1 o’clock this afternoon. Mr. Maltby was one of the oldest residents in this vicinity, moving here from Baldwinsville about fifty years ago. With his parents, Jacob Maltby and Sally Minor, of Puritan stock from Salem, Massachusetts, he became a settler on the site of what is now the village of Baldwinsville. At that time there were only two other familities in that territory, one the Baldwins, after whom the place was named. At the age of 50 Mr. Maltby moved to the town of Brutus, Cayuga County, where he followed the occupation of farmer for many years. Ten years ago he took up his residence near this village with his daughter, Mrs. Nesbitt, who with a son, Atchison Maltby of Weedsport and four brothers survive. Mr. Maltby had been active for a man of his years until last summer, when he had an illness from which he did not fully recover. His mind, however, was exceptionally bright until within a few hours of his death. He did not use tobacco or stimulants. His entire family has lived to reach the age of 70. Rev. Frederick L. Anderson, pastor of the Baptist Church, officiated at the funeral services. Burial was made at Weedsport Rural Cemetery. James Maltby (1890- ) remained a bachelor. William Smolinski (1965- ). Like his father, Billy graduated from LeMoyne College and played basketball for the the Dolphins. He also is an attorney in Solvay. Joseph Wilson (1994-2010) North Grafton, MA. Died of injuries suffered in an automobile accident. Merritt Maltby (1876-1955) m. Cora Kordmacher (1880-1958) 2nd wife.